Exclude entire keyspaces or specific tables within a keyspace from unnecessary repairs during a subrange repair. Exclude entire keyspaces and all its tables within that keyspace, or exclude specific tables within a keyspace. Doing so reduces use of system resources during the repair process, and can shorten the repair cycle time. The OpsCenter Repair Service already excludes certain system keyspaces from repair by default. 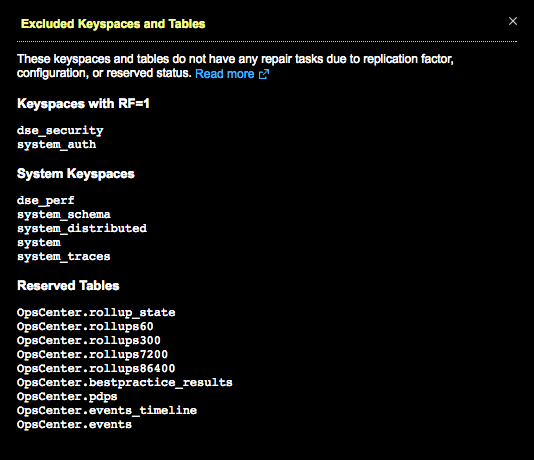 Keyspaces with a replication factor of 1 are always automatically excluded from repairs. Examples of keyspaces that are candidates for exclusion are those for which data loss is not a concern, such as those that summarize data duplicated or rebuilt elsewhere. Additional scenarios for excluding keyspaces might those with be a wide variety in gc_grace_seconds table values, and those keyspaces that are maintained by a custom script. The Repair Service ignores the specified keyspaces or tables during repairs. The keyspaces and tables configured to ignore never appear in the Table Repair Tasks pane in the Repair Service Status. The ignored keyspaces and tables are visible in the Ignored Keyspaces or Ignored Tables sections of the Excluded Keyspaces and Tables dialog available from the Repair Service Status dashboard. See View keyspaces and tables excluded from repairs.